Where to stay near Deep Ellum? 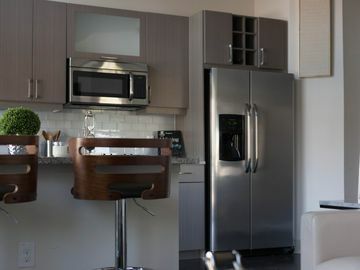 Our 2019 vacation rental listings offer a large selection of 134 house rentals near Deep Ellum. From 11 Houses to 76 Studios, find unique vacation rental for you to enjoy a memorable stay with your family and friends. The best place to stay near Deep Ellum for a long holiday or a weekend break is on HomeAway. Can I rent Houses in Deep Ellum? Can I find a vacation rental with pool in Deep Ellum? Yes, you can select your preferred vacation rental with pool among our 53 vacation homes with pool available in Deep Ellum. Come and experience Deep Ellum and its live music, art galleries and theater scene. This city is cosmopolitan and romantic, recognized for its restaurants, wildlife and shopping. Morton H. Meyerson Symphony Center and Kay Bailey Hutchison Convention Center are just a couple of the must-sees in the area. A vacation rental can help make your stay complete—many rentals come with a full kitchen and laundry facilities.